During their meeting on Nov. 9, the Keller ISD Board of Trustees discussed and made some revisions to the proposed changes in the GPA/ranking system presented at a public assembly back in Sept.
On. Dec. 7, the board will be voting as to whether or not these changes are to be officially applied to the EIC policy. The table below shows how GPAs will be converted. 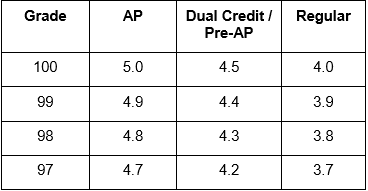 It suggests that AP classes will keep the 10 extra points while Pre-AP and Dual get 5. Additionally, the only AP/Pre-AP classes that will allow for students to earn the extra points will be limited to only the ones that are required for them to graduate. For example, the 10 points will be rewarded to them if they were to take AP World History since a world history class is mandated for graduation, but no points will be given to them for taking AP Psychology. Some teachers such as AP Physics I, AP Physics II and AP Physics C teacher Dawn Gallenstein view this change to be more helpful for students, explaining how it will drive them to join classes with subjects they are more passionate about without having to play the GPA game. Meanwhile, some students think it would be unfair to those who do take the more rigorous classes. AP Government and AP U.S. History teacher Michael Otto offered an analogy to describe his take on the change. As said, a previous article has been written with more information concerning the changes that make up this proposal. Decisions of the board will be finalized on the upcoming Dec. meeting.